I am off to dust my daughter’s room. She arrives home from college tomorrow for her spring break. I can’t wait to giver her a great big hug! 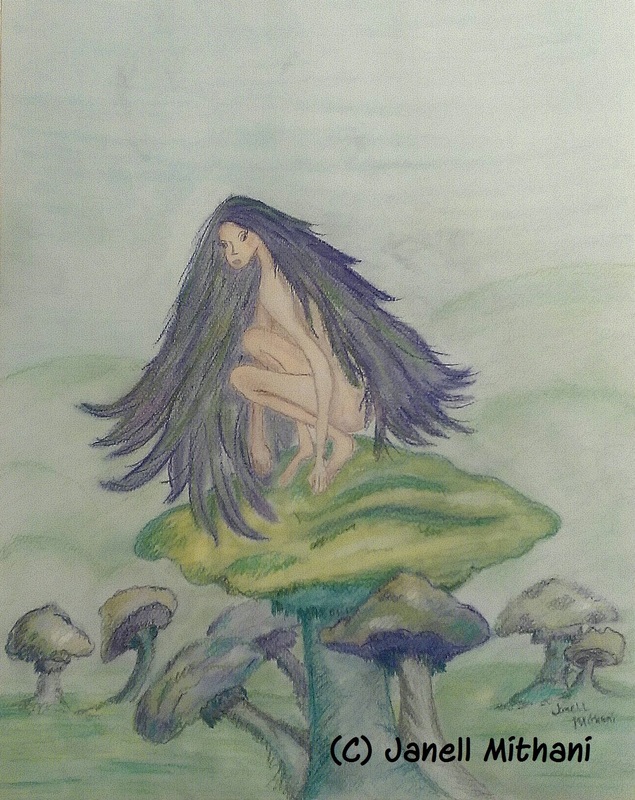 This entry was posted in Art, Art and Women and tagged fairy, mushroom, painting, Pastel. Bookmark the permalink. That’s beautiful, Janell. You should really revisit pastels more often. 🙂 Enjoy your time with your daughter! Oh, to have long purple hair . . . and such slim, flexible limbs! 🙂 I love how she’s crouched, ready to jump off. Enjoy your daughter’s visit! Thanks, Jill. I’ll enjoy every minute. Love the world you have created here Janell – I need a bit of fantasy today and you’ve captured it for me. I adore this beautiful fairy Janell! Fabulous, fabulous hair, love the pose, her fragile frame and what better place to sit for a purple haired fairy then on a mushroom! Lovely, wonderful and most delightful work! what a fun little piece. and yes, enjoy your time with your daughter… they grow up so fast! Mary, thank you. Glad I could bring you some fantasy today! Happy Spring! Eva, Thanks. We are having a great time, sitting at the dining room table across from each other on our laptops! HA! Actually, we are off to a reception at a little gallery that has 6 of my paintings on display in a few minutes. The start of a great fairy inspired week! Hope you enjoy your week, too! L’Adelaide, yes they do – In the blink of an eye! Thanks for stopping by. Hope you are feeling well and enjoying some spring weather. SHE’D BETTER GET HER PARTY DRESS ON….THIS WEEKEND WILL BE ROCKING!! !